This idea was sent in by Simon F.
Mankind has a bottomless reservoir of laziness, which is fertile ground for the best inventions in history. The dishwasher, television remote, and cruise control are a few examples. 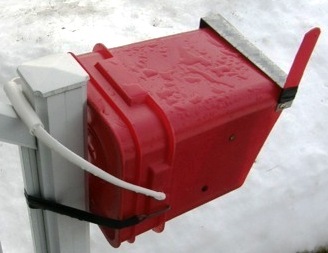 Here’s the latest in the important category of avoiding unnecessary work: the bucket mailbox. To make your own, you just need a 4 gallon square pail and an exacto knife or similar cutting tool. Angle the cut to help keep moisture off your mail. 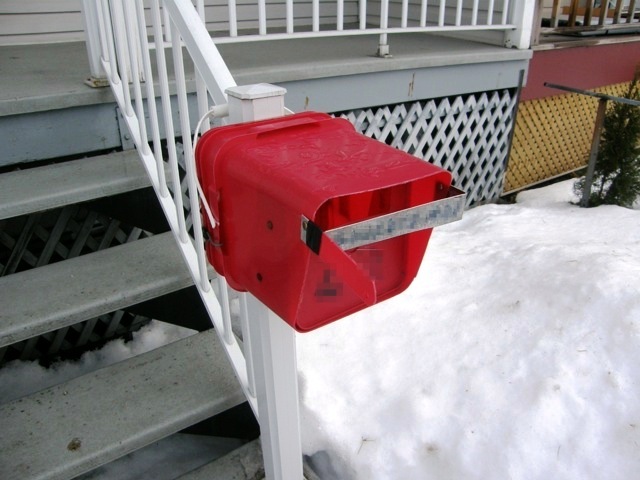 If you look closely, you’ll notice that the flag handle has the name of the resident written on it, clearly identifying it as a mailbox.